Despite hearing Jonathan Pryce’s narration, the first vision we see of Don Quixote is an actor in a commercial (Jose Luis Ferrer), attacking a windmill. It breaks down, and The Man Who Killed Don Quixote pulls back to reveal the film shoot, unhappy advertising types flitting about in the hot Spanish sun. At the center sits Toby (Adam Driver), a proclaimed creative genius, though it’s unclear who proclaims it or if anyone really means it. He’s lost (in La Mancha). Having sold his artistic integrity for advertising, he has no compass and no center, and he knows it. Yet the vodka he’s shilling — somehow linked to Don Quixote in his mind — involves so many big power players, he’s not just lost but trapped. It’s a Terry Gilliam film, so different audiences will disagree about what Toby needs and what Toby finds. That Toby encounters his star from a decade previous, a cobbler (Pryce) whose face looked so perfectly Quixotic, is absolute. 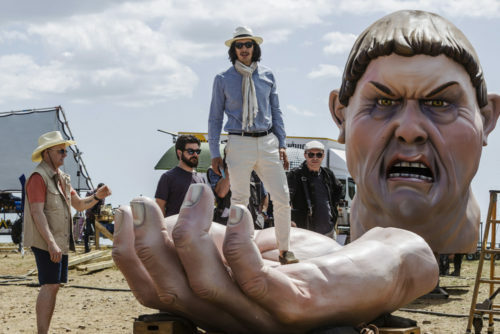 Somehow the process of filmmaking filled the man’s head with delusions, and as in Miguel de Cervantes’ novel about Alonso Quijana, he believes himself to be Don Quixote, now 400 years old and cursed to never die. Bound by fate, Toby becomes Sancho Panza, reliving key sequences from the classic tale, with Gilliam and co-writer Tony Grisoni borrowing as much structure from Dale Wasserman’s musical Man of La Mancha as Cervantes’ novel. Sometimes it’s clear what’s really happening, but as the film progresses, the line blurs between journey and dream. In classic Gilliam theming, the line doesn’t matter. We’re all in a dream, if we’ll only wake up to it. Like a dream, the film takes a while to coalesce. Centering on the real-world rot around Toby leaves things disjointed. And then Pryce enters. Passionate and joyful, his Quixote stands ragged yet ethereal, so strangely charismatic that we can see Driver wrestling with himself — Toby knows better, knows he created this man in some ways, but wants to believe. What he really doesn’t know how to do is care. The script takes a couple of tortuous twists to justify the blending of fantasy and reality (technically time-travel comes into play, too — but that’s still more fantasy), but by that time the film has become just engrossing enough that we too want to believe. Supported by a strong cast, especially Joana Ribeiro as Angelica — she who might be Dulcinea, the film is what Gilliam films usually are — fascinating yet with a few ragged storytelling edges. Admittedly, some may find its attitude towards Islam problematic — but Gilliam is struggling to balance the respect for it found in Cervantes’ novel with poking fun at 21st century American fears. It doesn’t quite work, nor does the vagueness of Jaeneda’s “gypsy” seem like a very forward-looking vision. Infamously, this took 25 years to make, but the update which ties it to our specific time and place likely has made it stronger. Another theme of Gilliam’s work has been how the most powerful in our society — not the politicians, but the uber-rich — are like children, with deadly consequences, and that resonates even more in the 2018 version of the script. And to be honest, Driver handles the material better than original star Johnny Depp likely would have. 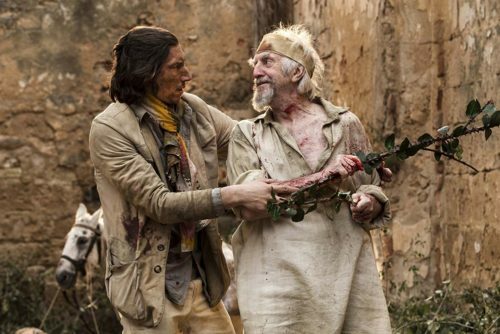 The Man Who Killed Don Quixote does not make itself easy to love, but its message may draw you back. Once you give in to its madness, you will find the method. May you find Don Quixote in your heart, and do better fighting the giants.